A London University student writes for help with his dissertation. Its topic is the relationship between Home Secretary Winston Churchill, the Metropolitan Police, and their handling of women’s suffrage demonstrators in November 1910. His questions illustrate Churchill’s domestic statesmanship. Our answers refute the belief that Churchill stridently opposed women’s suffrage except on isolated occasions. The suffrage argument was simple: give women the vote. Today it sounds perfectly straightforward. Over a century ago in Britain, the issue was complicated. The vote was restricted to “heads of household” (male). If extended to women, it would cover only the small number of female householders. A possible compromise was to enable married women to vote with their husbands as co-householders. This was opposed by the Conservatives, and even some of Churchill’s fellow-Liberals. Prime Minister H.H. Asquith, for example, feared that a “householder” franchise would increase the Conservative vote at Liberal expense. “The long-term solution, no doubt, was universal suffrage,” wrote Paul Addison in Churchill on the Home Front. “but this was sure to be rejected by the House of Lords, and could not be enacted until their lordships’ powers were reduced.” In 1910-11, Churchill and other Liberals were working to do that. Prime Minister H.H. 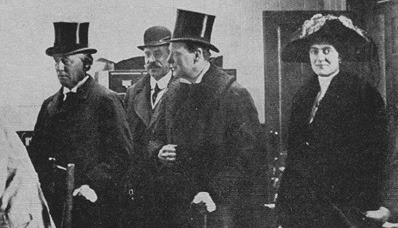 Asquith, Winston and Clementine Churchill, 1911. Churchill actually wrote Asquith to advise on political tactics by the government, not to debate the merits of women’s suffrage. Asquith’s response, suggesting that he might attend an anti-suffrage rally, incidentally shows that on that issue he was far more a diehard than Churchill was. Fictitious quotes twisted or made up to suit people’s preconceived prejudices pervade much of today’s Churchill discourse. Worse, in my opinion, are incorrect website abstracts of historical documents. And here we have a flagrant example. Letter from WSC to the Prime Minister [Herbert Asquith, later 1st Lord Oxford and Asquith] on women’s suffrage, particularly on the danger of splits within the Cabinet, recommending a referendum on the subject. [Manuscript copy, in letter book]. Churchill, in his younger years, felt that women should not vote, writing in his copy of the 1874 Annual Register that they are “well represented by their fathers, brothers, and husbands.” Even when he voted in March 1904 in favour of a female suffrage bill, he was never more than a lukewarm supporter. (Under the then-current voting system, equal rights would only have enfranchised a minority of women [householders], most of whom were likely to vote Tory, so many Liberals were reluctant to endorse this type of reform.) The logical solution—universal suffrage for both sexes—was a course to which Churchill was firmly opposed. Here, he responds to Prime Minister Asquith, when the latter first broached the possibility in November 1911, outlining his thoughts on women’s suffrage and its implications for the contemporary political landscape. This is seriously misleading. Churchill’s 1897 notes in the Annual Register are misquoted. Asquith had not broached universal suffrage. Churchill does not comment on it. Instead he advises Asquith for the government’s sake to avoid the disruptions and divisions of the suffrage issue. If necessary, he recommends putting suffrage to the nation in a referendum. Unfortunately, on the public “Collection Highlights,” one cannot read his actual words. They appear only as an unreadable thumbnail. Churchill had good reason for writing as he did. Nineteen eleven was a fraught political year. The Agadir Crisis (July-November) had woken Britain to the German naval threat. In its midst, Asquith had appointed Churchill to head the Admiralty. Irish Home Rule was a raging debate. The Parliament Act, preventing the House of Lords from vetoing money bills, was key to all the Liberal government reforms. It finally passed in November after almost a year of wrangling. Churchill, fearing “great danger to the Government” over yet another major issue, said it would be “a ridiculous tragedy” for “this strong Government from which so much is hoped.” This is not what “Collection Highlights” leads us to believe. Back to our student queries…. On the 16th and 18th they were not in writing. On the 22nd they are clear. But first consider the context. It is true that Churchill later resisted a public inquiry over the “Black Friday” atrocities, but he had good reasons. 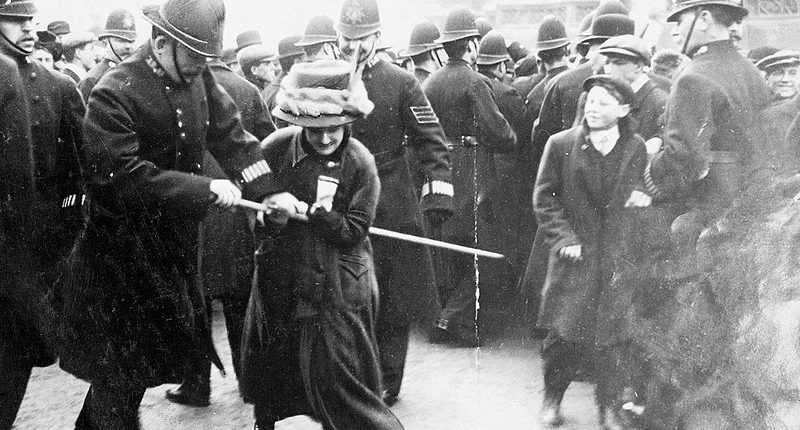 With militant suffragists launching bombing campaigns, beating up cabinet ministers and slashing paintings at the National Portrait Gallery, an inquiry would have demoralized the police who had to cope with those evil things. If someone had died or been seriously injured, there would have been a stronger case for an inquiry. 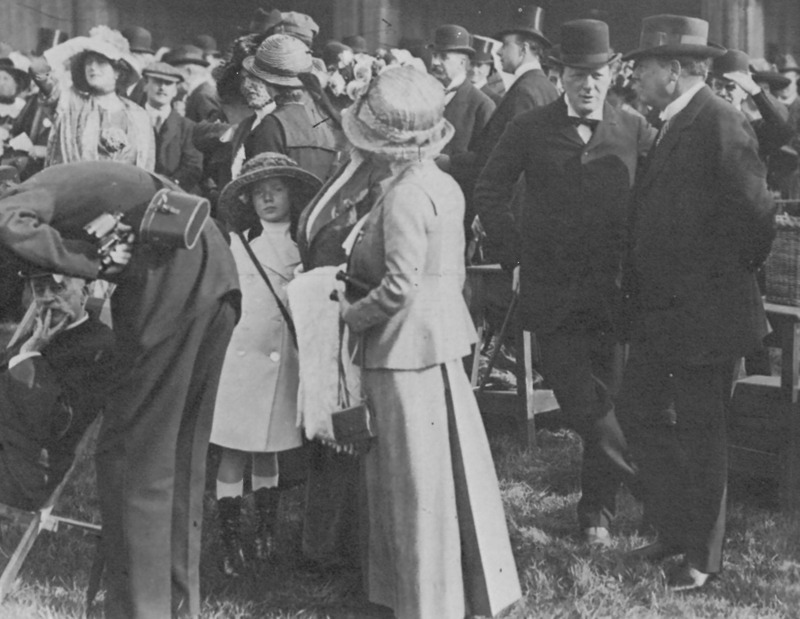 Home Secretary Churchill conversing with Lord Northcliffe, Hendon, 12 May 1911. Clementine Churchill is at left shading her eyes. Churchill was not philosophically hostile to the principle of women’s suffrage at any time in the 20th century. He voted for it as early as 1904. His hesitations in 1905-12 arose when militants tried to break up his speeches. He resisted certain measures at certain times for tactical reasons—unlike, say, Asquith, who in 1910-12 opposed the very principle. Churchill did express doubts over a universal franchise, telling Lord Riddell in 1912, “we have enough ignorant voters and don’t want any more.” In the 1920s he opposed extending the franchise to women 21-30, fearing it would increase the Labour vote. In the 1930s, with dictatorship on the rise through democratic elections, he again expressed doubts about universal suffrage. All that is open to criticism, if hardly antique. Similar arguments about other groups of new voters are heard today. Plus ça change, plus c’est la même chose. On women’s suffrage in 1910-11, Churchill has been misrepresented by a manufactured quote, curiously bowdlerized from his comments as a 23-year-old and misleadingly described. To place what he wrote in 1897 in the context of the Edwardian era is to ignore his political evolution from Tory to Liberal, from youthful imaginings to political maturity. I apprehend great danger to the Government over women’s suffrage. There are 3 main questions which must be answered satisfactorily. 1. Is there a real desire on the part of great numbers of women to assume political responsibilities? 2. Would this addition to the Electorate be for the good of the country now? 3. Has the country ever been effectively consulted? Your own position appears to me to be likely to become extraordinarily difficult from the moment that a female suffrage amendment is included in the Government Bill; for you will then be accused of using the machinery of the Parliament Act to force upon the Sovereign and upon the constituencies a vast change for which no organised Government or party will become responsible, on which the Electors have never pronounced, and which you yourself have characterized as a ‘disastrous political mistake.’ Further, if your colleagues are going to take the field and work themselves up into a keen enthusiasm for Female Suffrage, then members of the Government who do not agree with them will be forced to express themselves in a contrary sense. You yourself may even be drawn into the fray. This anomalous condition may possibly be tolerated so long as the question is academic or of small importance; but if it became imminent and important and real, the Government would be utterly discredited. It is certain that as the issue became more real passion will rise in regard to it and make it a subject of overwhelming importance. What a ridiculous tragedy it would be if this strong Government from which so much is hoped were to come to grief in this ignominious way, and perish like Sisera at a woman’s hand. What about the King: will he not be pressed to use the prerogative of dissolution in 1913 in the same way as he was pressed to use the prerogative of creating peers in 1911? I cannot help thinking that in all the circumstances which I foresee he might be justified. He would certainly not be disinclined. If we had to fight an election, in confusion ourselves, with Home Rule on our shoulders and with the Plural Voter still active, we should be beaten decisively; and with us would fall the Irish cause, with all the hopes which are centred upon it. I am quite sure that the adding of 8,000,000 women to the register will never be achieved without some form of appeal to the nation. Nor ought it to be. I have written since their speeches both to Grey and to Lloyd George pointing out these dangers and explaining that I could not indefinitely remain silent; and last night by arrangement we all three dined together to discuss the difficulty. We had a very valuable talk, and both were very much inclined to adopt a suggestion which I put forward, and which Lloyd George developed, that is, that if the women’s clause were carried, the adult suffrage register should be forthwith constructed, and as soon as this was complete the whole mass of the women to be enfranchised should, either by referendum or initiative, decide whether they would take up their responsibilities or not. In order to get them (Grey and Lloyd George) to adopt this position, I should have to go with them on the democratic amendment, so that we could all work together; and I am bound to say that any objections to the change would be greatly diminished if 3 or 4,000,000 women, representing as they would every household in the country, had specifically asked for it. Also, it would probably get smashed which again would be a solution. The conciliabule refrained from coming to any fixed agreement, but we parted with a feeling that unity on these lines was not impossible. If the Tories were to say, why don’t you have a referendum on Home Rule as well as about the women, our answer (debating) is clear. We have no objection at all to applying the same principle to Ireland and having a referendum on the Irish question to the Irish people. I hope whatever happens nothing will be said to close up this loophole of escape, which is the only one I can see. Hopwood, as he told you, has felt obliged to decline my offer. I will write further as to your designs upon him in a day or two. There is much force in what you write about the women. London and others are organising a great ‘Anti’ demonstration at the Albert Hall on February 28th, and tho’ I have not yet come to a final decision, I may feel it my duty to go there. I am clear that the Government as a Government, could not take any other course than we have taken. The only alternative was for the minority among us to resign. I reserve my judgement as to the practicability of your referendum until I have further considered it. As I understand, you propose that only the women should be referees? Why? I am much more disquieted by the general political situation. These Scotch bye-elections were a great error of judgement on the part of the Master [of Elibank], and would not have happened if I had insisted on my own view. But they have their uses, as a fairly clear indication that, even here in Scotland, Insurance is for the time costing us heavily. A man writes to me today, from my own constituency, that he believes 80 per cent of the ploughmen there would at this moment go against us: no doubt a great exaggeration, but by no means a pure invention. All this means that we open 1912 with a lack of cohesion and driving part in the forces behind us. I am more and more convinced that if we are to escape ridicule and ultimate disaster, we must, coũte que coũte, lighten our commitments for the year. We cannot get through them except in a session of 10 or 11 months, with two and probably three drastic guillotines. Even if the House of Commons does not mutiny (which is more than likely) the members of the Government will be reduced by the end of the year to physical and mental decrepitude. The legal life of this Parliament does not terminate until December 1915, and a session in that year would be available as the third session under the Parliament Act. It is, of course, the natural (and not unnatural) jealousies of rival groups causes which have made it necessary to announce what I may call a pari passu programme. But their respective adherents may be brought to a more reasonable view when they realise that to attempt the whole is to endanger every one of its parts. These are matters which seem to me to call, not for hasty decision, but for the most serious consideration by all of us during the next few weeks. Randolph S. Churchill, ed., The Churchill Documents vol. 5, At the Admiralty, 1911-1914 (Hillsdale, Mich.: Hillsdale College Press, 2007), 1475-77. 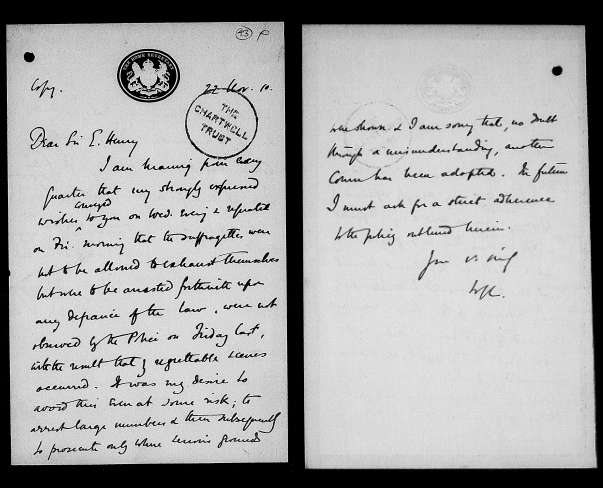 Transcripts of this letter in both volumes are marked “extract,” meaning they omit the exchanges on Sir Francis Hopwood, a separate matter. (In 1912 Hopwood was appointed a Civil Lord of the Admiralty.) Churchill’s letter in the Archives is a copy drafted by his secretary Eddie Marsh; the final sentence is presumably Marsh’s note that the original contained some added lines on those subjects.